As the volume of business data has grown in recent years, so too have expectations surrounding the performance and value of analytics tools. Fortunately, thanks in large part to AI and machine learning, a handful of analytics tools have risen to the occasion. Historically, an enterprise-level CPG would work with a traditional business intelligence (BI) platform that was designed for data scientists and very technical to deal with. Now, similar consumer goods companies can rely on what Gartner has coined to be “augmented analytics” solutions. An augmented analytics platform uses machine learning and natural language programming to automate insights for non-technical users. In other words, business teams can easily run reports and drill down into data to answer core questions and make informed, data-driven decisions. If you’ve clicked on this article, you likely recognize the value in transitioning to an AI-powered, augmented analytics solution and have started the search for a platform. To aid in your search, this article breaks down a three-step process for picking the right platform for your CPG. Evaluate your current state and determine if new data analytics software is needed. Define what a successful implementation will look like. Review your options and make a decision. Or, continue scrolling to read the full article. 1. Evaluate your current state and determine if new data analytics software is needed. Before you start a comprehensive search, you need to look inward and identify the strengths and weakness of your current analytics process. First, review the process. The goal here is to understand how a report goes from concept to reality and if there is a possibility for further investigation after the initial report is generated. Think critically about process efficiency and effectiveness. Does the analytics department field more requests than they can possibly keep up with? Do business users frequently decide against ad-hoc reporting because they need an answer sooner than your process allows for? Are your data scientists and analysts consistently generating nearly identical reports that just have updated data? Are follow-up requests generally as time consuming and labor intensive as initial requests? As you can tell, if you answered yes to a number of those questions, there are definitely inefficiencies in your analytics process. You can circumvent those inefficiencies with a self-service solution that uses natural language to let non-technical users drive their own reporting process. For example, imagine that one of your brand managers wants to see a report for sales by state over the past year. After seeing that report, she decides she wants to also analyze product sales in the southeast over the past year. With a self-service, augmented solution, that brand manager can handle all of this on her own. As she continues down this path of curiosity, she can also pivot from these “what’s happening” questions to “why is this happening” questions. With a traditional business intelligence solution, that same brand manager is looking at a drawn-out process to even get her first question answered. After you have reviewed your process, consider the functionality of the tool or tools you’re already using. Do you rely on more than one BI tool, acquired over time to solve for issues that a single tool could now solve? Do you feel that your analytics solution is not being used to its fullest potential? Are you struggling to use your current analytics solution to handle the massive amounts of data you have (both in-house data and syndicated data)? Does your tool require you to house your data in a specific format (i.e., cloud-based vs. on-premises)? Like with the exercise above, answering yes to a number of those questions indicates that you’re in a place to consider finding a tool that works better for a leading CPG’s needs. Finally, you also want to evaluate how your analytics status is impacting your team members. This evaluation needs to look at both business users and experts like analysts and data scientists, as both camps are heavily affected by the data analytics software that you use. Are your data scientists and advanced analytics experts stuck running basic reports rather performing high-level work? Are you business users so frustrated by delays in the process that they refrain from asking questions and truly leveraging data? Has the time it takes to complete data requests remained stagnant, even though you have expanded the analytics department? Do your non-technical users have little-to-no ability to use your current tool without assistance? Answering yes to these questions implies that your analysts and business users are likely equally frustrated by the process. It also implies that your current solution is not efficient or properly utilizing the strengths of your employees. 2. Define what a successful implementation will look like. 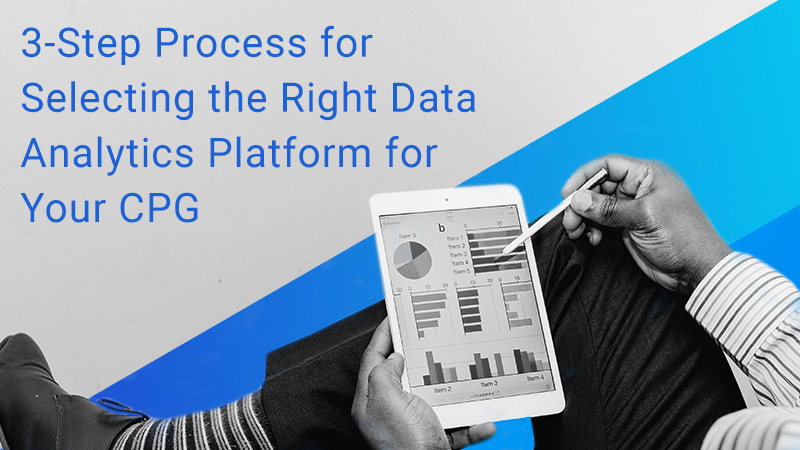 Now that you’ve determined that you do in fact need a new data analytics platform, you should define what a successful implementation will be for your CPG. Then, you’ll be able to use your definition of success as a guiding principle in assessing potential analytics vendors. Tactical: This kind of objective will be highly quantifiable. For example, you might want to reduce the time it takes users to get business questions answered. You could aim for 25 business questions answered in the time it previously took to answer a single question. Cultural: This category is a bit more of an intangible, although it is certainly valid. You might, for instance, want to encourage more curiosity and data-driven decision making across your business. You can learn more about how curiosity can benefit your company by checking out our case study with SnapAV. Bottom-line oriented: This is probably the first success metric you thought of because the bottom line matters. It is massively important. Maybe you want to insights from analytics to increase revenue by 10%. Maybe you want to reduce churn by a certain amount. Regardless, knowing your hardline goals before shopping can help you narrow your list of potential analytics vendors. CPGs that are looking to edge out the competition should define success across all three of the above categories prior to shopping. Your goals don’t have to be fixed, but getting into that hyper-specific mindset is how you’ll end up with a solution that meets your company’s full breadth of needs. Additionally, if you have data scientists or analysts on your team, you should check in with them, too. A successful implementation would include syncing up your data with your analytics software and ensuring that more extensive functionality is available for the deeper data questions that would be beyond the scope of the average business person’s role. Or, keep it simple and invite your data team to any product demos so that they can ask these kinds of questions themselves. 3. Review your options and make a decision. For this stage in the process, be as thorough as possible. Any vendor you consider should wow you in with their demo and offer a comprehensive proof of concept. As you narrow down the list, there are going to be countless points and questions to consider. To help you make sense of all the features that are thrown at you, here’s a list of six questions to ask, accompanied by more detailed follow-ups. Is there truly a user-friendly interface for business users (think: CMOs, brand managers, category managers, etc.)? Interface is user friendly and requires minimal training for end users. Product meets all accessibility guidelines. Product uses a search interface. Product is fully accessible on mobile. Queries can be made by typing or speaking. Product understands queries made in natural language, broad business terminology, terminology specific to a company, and languages besides English. Product resolves terms that have been mistyped. Reports can be scheduled, shared by users and non-users of the product, and printed, exported, and saved as CSV or XLS files or PDFs. Users can add and share comments. Are the data visualizations intuitive and readily digestible? Answers are automatically provided as visualizations, without users having to select a specific type. Product supports common visualization forms needed by the business as well as advanced forms. User can easily change the type of visualization presented, drill into a specific data element in a visualization and ask a follow-up question, drill into a visualization to get the underlying data in a table format, and add notes on the visualization to highlight key activity. Large amounts of data can be represented in a single data visualization. Is there a feature that provides deeper insight or next-level thinking? Product calculates advanced business queries based on questions asked. Product offers advanced analytics — forecasting and predictive analytics. Reports can be compiled into an interactive storyboard. Product produces a natural language narrative based on queries. Related questions are suggested and enable the next query. Is the solution open and flexible to any data source? Data can be stored on-premises. Data can be stored in the cloud. Product can handle incremental data loads. Data import and updates can be handled without vendor involvement. Data can be formatted in numerous ways. Product can handle structured and unstructured data. Product can support large quantities without performance disruption. Data is backed up routinely to allow for quick restoration if needed. Will the vendor be able to get up and running smoothly and efficiently? Deployment can be done in a quick time frame. Product deployment includes user training and a library of help materials. Vendor offers live support during and after business hours. Vendor offers support in languages beyond English. Product includes a means of sending feedback to the administrator and/or vendor point of contact. Vendor has taken steps to defend platform against vulnerabilities and hacks. Users can mask data to hide protected / sensitive information. Vendor does nightly backups and maintains backups for agreed-upon length of time. Access to the product is handled via username/password functionality. User privileges are set to determine which data each user can access. Administrators can define and set up roles and groups. User activity is recorded for administrator review, and audit trails exist for successful and failed logins, queries that provide zero results, data imports/exports, and more. As you can see, this is lengthy, but it is not even fully comprehensive. Use this as a springboard to dive into your vendor research and selection. For more on the selection and purchase, you’ll want our free eBook on buying analytics software. Download it here. Machine Learning in Business Intelligence Solves the Puzzle — If this article has piqued your interest in the intersection of AI and business intelligence software, check out our article that explains just how AI, machine learning, and business intelligence fit together to make an immensely valuable product for the end user. Natural Language & Analytics: A Cheat Sheet for Business People — Want to understand more about how natural language options are deployed in analytics solutions? Want to see what natural language accessibility can mean for your company’s bottom line. Check out our in-depth resource on all things natural language.